The framework for teaching described in this book identifies those aspects of a teacher's responsibilities that have been documented through empirical studies and theoretical research as promoting improved student learning. Although they are not the only possible description of practice, these responsibilities seek to define what teachers should know and be able to do in the exercise of their profession. Each component defines a distinct aspect of a domain; two to five elements describe a specific feature of a component. For example, Domain 2, The Classroom Environment, contains five components. Component 2a is Creating an Environment of Respect and Rapport, which consists of two elements: “Teacher interaction with students” and “Student interactions with other students.” This component applies in some manner to all settings, as do all the other components. But although teachers at all levels and in all subjects establish rapport with and convey respect for their students, they do so in different ways. Figure 1.1 summarizes the components and their elements; Chapter 4 describes them in detail. The components of professional practice constitute a comprehensive framework reflecting the many different aspects of teaching. Although the components are distinct, they are, of course, related to one another. A teacher's planning and preparation affect instruction, and all these are affected by the reflection on practice that accompanies a unit or lesson. In addition, many features of teaching, such as the appropriate use of technology or a concern for equity, do not each constitute a single component but rather apply to them all. Chapter 3 identifies the common themes that apply to many of the components. A framework for professional practice is not unique to education. Indeed, other professions—medicine, accounting, and architecture, among many others—have well-established definitions of expertise and procedures to certify novice and advanced practitioners. Such procedures are the public's guarantee that the members of a profession hold themselves and their colleagues to high standards of practice. Similarly, a framework for teaching is useful not only to practicing educators but also to the larger community, because it conveys that educators, like other professionals, are members of a professional community. A framework for professional practice can be used for a wide range of purposes, from meeting novices' needs to enhancing veterans' skills. Because teaching is complex, it is helpful to have a road map through the territory, structured around a shared understanding of teaching. Novice teachers, of necessity, are concerned with day-to-day survival; experienced teachers want to improve their effectiveness and help their colleagues do so as well; accomplished teachers may want to move toward advanced certification and serve as a resource to less-experienced colleagues. The complexity of teaching is well recognized, and this complexity extends over several aspects of the work. Teaching is physically demanding; teachers are active, moving from one part of the classroom, and of the school, to another. Student teachers, as every cooperating teacher knows, are physically exhausted at the end of a day. Teaching is also emotionally demanding, and the more caring a teacher is, the more demanding it is. Many teachers struggle to not care too much about the plights of some of their students, particularly if they are able to exert only minimal influence on the contributing factors. But even when teachers exercise self-discipline, they are frequently emotionally drained at the end of a day. More recent research has confirmed that teaching is also cognitively demanding; a teacher makes hundreds of nontrivial decisions daily, from designing lessons, to responding to students' questions, to meeting with parents. In other words, teaching is a thinking person's job; it is not simply a matter of following a script or carrying out other people's instructional designs. On a more general level, it is useful to think of teaching as similar to not one but several other professions, combining the skills of business management, human relations, and theater arts. Business managers set goals for groups of subordinates and try to lead them toward accomplishing the goals. Such managers must allocate time and other scarce resources as they balance task-related and socioemotional considerations. They distribute rewards and sanctions to those in their charge. Similarly, teachers must motivate students to engage in learning, set goals and subgoals, manage time and other resources, and be accountable for the results. Human relations work involves understanding the dynamics of a large group of individuals, each with a complex set of needs and desires. A teacher must also consider the range of individual personalities and take advantage of any opportunities for motivating students. A teacher must be able to connect with diverse students and establish relationships of caring and concern. In addition, in interactions with parents and colleagues, teachers must demonstrate sensitivity to multiple aspects of those relationships—personal, professional, and cultural. Theater arts include many types of professionals, such as director, stage manager, actor, set designer, and even playwright. Teaching includes an equivalent of all the components of the theater arts. But although a director can, for example, delegate responsibility for props and sets, a teacher must manage all materials. Moreover, teachers may have to follow a “script” they do not particularly like, and the “audience” is frequently not attending voluntarily. Other metaphors come to mind. Teachers have been likened to orchestra conductors, gardeners, engineers, and artists. Indeed, depending on which aspect of the job one is considering, any of these references may be appropriate. Many metaphors include students, such as Theodore Sizer's “student as worker; teacher as coach.” These metaphors remind us of the intellectual and emotional demands of teaching and the many, sometimes competing, aspects of the job. An environment of high-stakes accountability only exacerbates teachers' levels of stress. Schools are being asked to, in Michael Fullan's phrase, “raise the bar and narrow the gap” (2005). Teachers are under enormous external pressure, as never before, to prepare their students for productive lives in the knowledge economy and success in externally mandated assessments. Every profession establishes a language of practice, one that captures the important concepts and understandings shared by members of the profession. Similarly, a framework for teaching offers educators a means of communicating about excellence. This is not a new finding; because of Madeline Hunter's work, most educators know what is meant by “anticipatory set,” “input and modeling,” and “teaching for transfer.” Now, as our understanding of teaching expands and deepens, we need a vocabulary that is correspondingly rich, one that reflects the realities of a classroom where students are engaged in learning important content. Such a framework is valuable for veterans as well as novices as they all strive to enhance their skills in this complex work. During conversations about practice, particularly when such conversations are organized around a common framework, teachers are able to learn from one another and to thereby enrich their own teaching. It is this joint learning that makes the conversations so rich—and so valued. Therefore, although attendance at courses and workshops is an important vehicle for professional learning, so is focused conversation with colleagues. It is through serious, professional conversations about the framework's components that the components are validated for any particular setting. As educators study the components and consider them within their own contexts, they can determine which components and elements are applicable and which are not. This process is critical both to enriching the professional lives of educators and to ensuring that the components used in a given setting actually do apply there. Only educators in that setting can make those determinations. By providing an agreed-upon framework for excellence, a framework for teaching serves to structure conversations among educators about exemplary practice. A uniform framework allows those conversations to guide novices as well as to enhance the performance of veterans. Even before the initial publication of the framework for teaching in 1996, there was a long and highly respectable tradition of attempting to definitively describe good practice. Although the purposes of such frameworks have ranged from accountability to enhancing the profession, their value has been consistently recognized. The origin of identified components of professional practice lies in a combination of Madeline Hunter's work and research in process-product and cognitive science. Hunter was one of the first educators to argue persuasively that teaching is not only an art but also a science; some instructional practices are demonstrably more effective than others. This idea was also the message of process-product research, which sought to establish relationships among certain teaching practices and enhanced student achievement, as measured by standardized tests (Wittrock, 1986). The optimistic title of a book by Gage is instructive: The Scientific Basis of the Art of Teaching (1977). Identifying effective practices (and, in the case of Hunter, promulgating them) became the research focus in teaching during the 1970s and 1980s. Wittrock (1986) contributed to the collective knowledge base of educators by publishing the series Handbook of Research on Teaching. Exactly how to best use the results of research on teaching became the next challenge for educators. On a statewide basis, Georgia took the lead and used the research to create a performance assessment system as the basis for awarding a permanent license to teach in the state. Other states (particularly in the Southeast) followed suit, with systems that were modeled on Georgia's and yet had their own distinctive features. By 1990, state performance assessment systems were in place in North Carolina, Florida, and Connecticut, with others proposed (but never implemented) in Kansas and Louisiana. Over the years since then, policymakers in many states (and in numerous countries) have promulgated teaching standards to guide both teacher preparation and the evaluation of teaching. In response to, and in some cases independently of, the policy requirements, practitioners have discovered the value of clear standards of practice in structuring professional conversations. The earliest systems of teaching standards tended to identify specific teaching behaviors (such as writing learning objectives on the board) supposedly derived from the research on effective teaching, and to rate teachers on their demonstration of these practices. The later systems adopted a more complex view of teaching and considered the quality of a teacher's judgment. For example, a Connecticut competency states that teachers should be able to “formulate meaningful questions about the subject matter.” These developments reflect an increasing recognition of the complexity of teaching and the role of professional autonomy. Nationally prominent organizations have proposed sets of standards primarily for student teachers. For example, the Interstate New Teacher Assessment and Support Consortium (INTASC) developed standards for new teachers and has created a portfolio system designed to permit assessment of those standards. This combination has served as the foundation of standardsetting efforts in many states. A correlation of the framework offered here and the INTASC standards is shown in Figure 1.2. Similarly, the National Association of State Directors of Teacher Education and Certification (NASDTEC) and the National Council for Accreditation of Teacher Education (NCATE) have both proposed standards for beginning teacher competencies. And Educational Testing Service, in designing the Praxis series of assessments for states to adopt for licensing, developed Praxis III: Classroom Performance Assessments, in which trained and certified assessors observe classroom teaching and evaluate performance against established criteria (Reynolds, 1992). Understands the central concepts, tools of inquiry, and structure of the disciplines taught; creates learning experiences to make them meaningful to students. Demonstrates knowledge of content and pedagogy. Understands how children learn and develop; provides learning opportunities that support their development. Uses questioning and discussion techniques. Understands how students differ in their approaches to learning; creates instructional opportunities adapted to diverse learners. Creates an environment of respect and rapport. Establishes a culture for learning. Understands and uses a variety of instructional strategies. Creates a learning environment that encourages positive social interaction, active engagement in learning, and self-motivation. Uses knowledge of communication techniques to foster active inquiry, collaboration, and supportive interaction. Plans instruction based on knowledge of subject matter, students, the community, and curriculum goals. Understands and uses formal and informal assessment strategies. Participates in a professional community. Fosters relationships with colleagues, parents, and agencies in the larger community. The National Board for Professional Teaching Standards (NBPTS) has made an enormous contribution to teaching standards. It was created in 1987 following the publication of A Nation Prepared (Carnegie Forum on Education and the Economy's Task Force on Teaching as a Profession, 1986). Through rigorous assessments, NBPTS offers teachers the equivalent of advanced board certification in medicine. Just as a medical doctor earns an initial license to practice medicine and then passes a test for board certification in, for example, pediatrics, the theory of the national board is that teachers should be able to earn advanced certification in any of multiple disciplines or levels—for example, early childhood or high school mathematics. NBPTS offers more than 30 separate certificates to teachers; increasing numbers of teachers have taken advantage of this opportunity, finding the experience to be both challenging and professionally rewarding. The use of frameworks that define and describe excellence in teaching has produced powerful side effects. Even when the original purpose was to demonstrate accountability, practitioners themselves have enjoyed enormous benefits. It has long been recognized that articulating clear standards for student learning, illustrated by examples of exemplary student work, enhances the quality of that work and students' sense of purpose. Teachers have discovered that when they are clear to students about the criteria used to evaluate a science project, for example, students are far more focused, and the resulting projects are of higher quality than when such criteria are not provided. Furthermore, students who might have believed that high grades were beyond their reach now see clearly how to achieve them. The same phenomenon is at work with a framework for teaching. When teachers are beginning their careers, the challenge of becoming a skilled practitioner is daunting. Teaching is so complex and its various components so intertwined that many novices feel overwhelmed. A framework for teaching offers a structure for teachers to assess their practice and to organize improvement efforts. In addition, to implement teacher mentoring and licensing systems or to certify teachers under NBPTS, many educators must be trained as mentors or assessors. During such training, practitioners think seriously about teaching, learn to recognize the various components in different contexts, and as a result, reflect deeply on their own practice. This reflection, conducted in a professional and supportive environment and in the service of another purpose (becoming a mentor or a certified assessor), is an enriching experience. Practitioners report that the experience is their first opportunity in many years to discuss teaching seriously—in its complex entirety—with respected colleagues. The components of professional practice are part of a long tradition of applying standards to both student learning and the complex role of teaching. The benefits—for individuals, universities, or schools and districts—are enormous. A framework for professional practice has many distinct, though related, uses. These are described briefly here and in greater detail in Chapter 6. Many teacher educators, both in the United States and in other countries, have found the framework for teaching to be of value as they structure their programs to prepare students for the demanding and important work of teaching. The framework contributes to the organization of the program itself, the courses offered, and the supervision of student teachers. Teacher educators have found that when they recognize the existence of a clearly articulated framework for teaching that describes the work for which they are preparing their students, they must be able to offer assurance that their graduates are, in fact, proficient in the knowledge and skills described in that framework. Such recognition leads naturally to an “audit” of their own practice, to ensure that their programs include what students will need to be successful as teachers. Furthermore, during the clinical phase of teacher preparation, teachers-in-training benefit from a clear framework for teaching, both in their observations of experienced teachers and as an organizing structure for the feedback they receive from their supervisors. Many school districts have discovered that recruitment and hiring are facilitated if those activities are informed by a coherent definition of good teaching, one that is aligned with their approaches to mentoring, professional development, and teacher evaluation. As a result, they have created interview questions based on the components and elements of the framework for teaching, ensuring consistency in the interview process and in the skills of teachers who join the faculty. Furthermore, through their questions, educators convey to teaching candidates what the district values and how it defines good teaching; as a result, when the new teachers are later working in the schools, they are not surprised by the district's conceptualization of good teaching. Most professions designate a period of apprenticeship for a novice practitioner. Doctors work as interns and residents before assuming complete responsibility for patients. Attorneys practice as clerks for experienced lawyers or judges and then join a firm or an agency where they practice with attorneys experienced in the different specialty areas. Social workers employed in public agencies work under supervision before they earn a license to practice on their own. But teachers, from the moment they are awarded their first license and work as the teacher of record, are considered full members of the profession. The responsibilities of a first-year teacher are just as complex (in some situations, more so) as those of a 20-year veteran. In very few locations do teachers have an experience equivalent to the internship of a doctor or a social worker; they are plunged immediately into the full responsibilities of a teacher. A newly licensed architect, for example, would never be asked to design a major building the first week on the job, all alone. But this is exactly what teachers are asked to do, and it reflects a structural challenge in the profession. Any structural solutions that might be effective, such as professional development schools that include a full-year internship, are expensive to implement. Given the complexity of teaching, a map of the territory is invaluable to novices, providing them with a pathway to excellence. If the map is used well and shared by mentors, it can help make the experience of becoming an accomplished professional a rewarding one. Furthermore, well-designed mentoring programs significantly reduce the rate of attrition of new teachers. 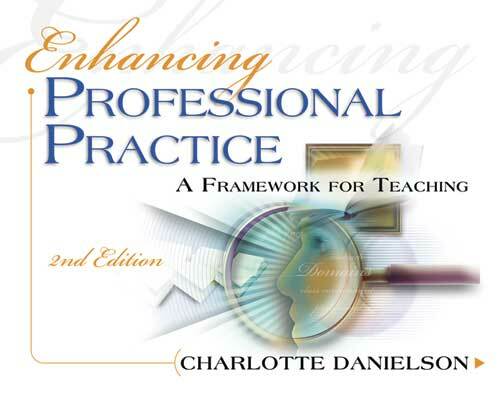 A framework for professional practice offers the teaching profession the same definition long afforded other professions. A framework answers the questions “What does an effective teacher know?” and “What does an accomplished teacher do in the performance of her duties?” A framework is useful for all teachers, from those just entering the profession, to veterans who may have lost enthusiasm for their work, to master teachers who are trying to convey their wisdom to others. Thus far, educators have lacked an agreed-upon structure that reflects new understandings of teaching and learning and offers a context for describing and discussing excellence. They rarely devote precious time to professional dialogue and sharing of techniques. A framework for teaching provides the structure for such discussions and an opportunity for genuine professionalism. When novice teachers meet with their mentors or when experienced teachers consult with their coaches or supervisors, they need a framework to determine which aspects of teaching require their attention. They must decide which parts, of all the complex elements of instruction reflected in any lesson, to concentrate on. A framework for teaching provides such a structure. Without a framework, the structure is reduced to whatever the mentor, coach, or supervisor has in her head, and it thus reflects the personal beliefs that individual holds about teaching, regardless of whether these have ever been made explicit. Many teachers have had the experience of conducting what they thought was a brilliant lesson only to have a principal react negatively because, for example, students were talking to one another. The teacher and the principal did not share a common understanding of what represented effective teaching. With a framework for teaching in hand, however, participants can conduct conversations about where to focus improvement efforts within the context of shared definitions and understandings. When a teacher is struggling in the classroom, when a lesson is ineffective, or when students are not engaged, a comprehensive framework is useful in identifying the source of the difficulty and therefore in guiding improvement efforts. These conversations focus on means, not ends, and they are conducted in an environment of professional respect. An important step to enhancing the stature of educators in the family of professions is defining clearly what constitutes excellence in teaching. As long as practitioners present teaching as a mysterious art form without well-defined duties and competencies, the larger community will regard it with mistrust. For example, many in the general public do not understand the need for teachers to attend courses and workshops: “They went to college, didn't they?” The clarity that a framework for teaching provides, including Component 4e, Growing and Developing Professionally, can situate such activities squarely within the responsibilities of teaching. A framework for professional practice has important uses in the service of teaching and learning. These uses demonstrate the framework's power to elevate professional conversations that characterize the interaction of exemplary teachers everywhere. Copyright © 1996, 2007 by Association for Supervision and Curriculum Development. All rights reserved. No part of this publication—including the drawings, graphs, illustrations, or chapters, except for brief quotations in critical reviews or articles—may be reproduced or transmitted in any form or by any means, electronic or mechanical, including photocopy, recording, or any information storage and retrieval system, without permission from ASCD.